Developer Quote: "Classic artwork gets a modern twist in this wonderful interactive doll house & dress-up app, with Mary Engelbreit's Paper Doll Dress-Up"! 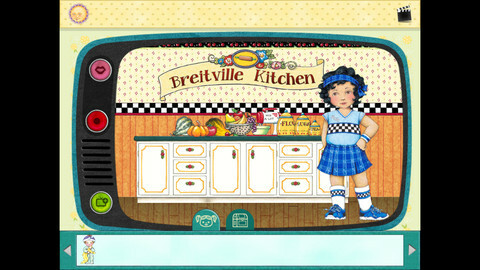 Dress your paper dolls, decorate doll houses, even record your own 'TV show'!" Kids and toys go together like peanut butter and jelly. In particular, kids like to play act and mimic real life situations with dolls. Paper dolls have always been a popular source of entertainment as it is easy for kids to change clothing, accessories and scenery with these lightweight toys. As we are in an electronic age, however, even the best of artists have turned to media to share their talents. In this case, the well known artist, Mary Engelbreit, who illustrates with such classic and simple charm has lent her distinctive style to Mary Engelbreit’s Paper Doll Dress-Up: “Breitville” (by Auryn). In this adorable paper doll, iPhone and iPad children's app, you will find a make believe town that is teeming with fun and paper doll characters! In fact, when you ask the dolls a question, they actually answer you! Interact with dolls, pose questions and record mini TV shows with them. - Five dolls with mix-n-match outfits are included: two girls, two boys, and a baby. 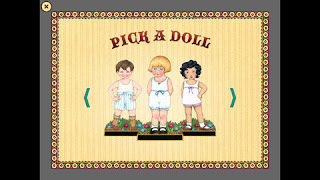 - Interactivity: Ask the dolls a question, or tell them that you love them and they’ll respond! - Customize the décor: With hundreds of items to choose from, you can decorate up to three houses (each house has three rooms and a garden), a park, and the beach! With so many facets to Paper Dolls Dress-Up, kids will be happily imagining and creating styles, scenery and dialog for quite a while. Being able to create make-believe TV shows where kids can express themselves is a marvelous idea in extending interactivity. My favorite feature though (maybe because I'm an adult?) is decorating the houses and arranging the scenery. Who says adults can't play paper dolls after all? COOL CONCLUSION: The variety of charming and colorful entertainment included in Mary Engelbreit's Paper Doll Dresss-Up will stimulate the minds, hearts and imaginations of kids around the world. Mary Engelbreit's Paper Doll Dresss-Up: "Breitville"
~ Also visit our site page Free Apps-Staff Picks to see what's been FREE the past few weeks! ~ Hot Deal: 10% off Promotional Packages B - E! Get yours NOW! Subscribe to Cool iPhone, iPad and iPod Touch Apps by selecting either: E-mail or RSS Reader.. Also follow us on Twitter , Facebook, Google+, Pinterest, and Instagram. * See our Hot Deal of the Week for great advertising prices! To request ad promotions, use our easy Advertising Order Form, or send us an e-mail with your request.